THE ROSTER AND PLAYOFF PROFILE FOR BOTH THE CHICAGO BEARS AND THE INDIANAPOLIS COLTS ARE ON THE BOTTOM OF THIS PAGE. 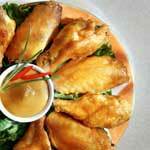 Want to make this year's Super Bowl XXXVII Party your best yet? The following tips and recipes include everything you'll need to make your party easy and delicious - including a blitz of great tasting food ideas plus some excellent ideas that will make your party less work and more fun! 1. Assemble some team pennants or banners in your entry way to get your guests immediately into the spirit of the game. Put on some upbeat music before the pre-game show begins! 2. Wrap fresh chopped vegetables for dipping in damp paper towels and put them in plastic bags before refrigerating. Remove amounts as needed. 3. Unique food presentations make the party more fun. Use hollowed out vegetables such as cabbage, eggplants or bell peppers to contain other foods like Kraft Dressings and Kraft Dips. Use your imagination! 4. To keep your party food warm and tasty all game long, place back-up hot dishes (covered) in a low 200°F oven. Replenish your buffet table as needed. Guests will think you are cooking throughout the party! 5. It's OK to ask friends and family to help out with getting ready for your Super Bowl XXXVII Party. People are usually happy to bring things to the party or to tidy up afterwards. And this way, everyone can enjoy game day together! Remember, your guests are going to arrive hungry and ready to party. 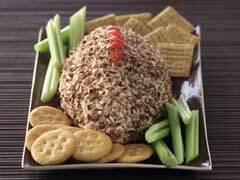 So, before the party kicks off make sure you have your pre-game appetizers out and ready for snackin'. 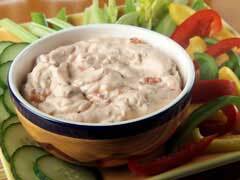 These snacks and dips should keep them satisfied well into the first half of the game! TOSS cereal, pretzels and popcorn in 15x10x1-inch baking pan. Mix butter, Worcestershire sauce and seasoned salt in small bowl. Drizzle evenly over cereal mixture; toss to coat. POUR mixture into large microwavable bowl. MICROWAVE on HIGH 5 to 6 minutes or until crisp, stirring after 3 minutes. Cool. Store in tightly covered container at room temperature. Mix cereal mixture as directed in 15x10x1-inch baking pan. Bake at 300°F for 30 minutes or until crisp, stirring after 15 minutes. MIX dressing, sour cream and salad dressing mix until well blended. Add remaining ingredients; mix well. Cover. 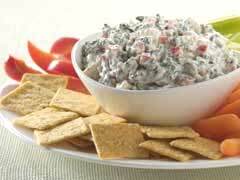 SERVE with assorted NABISCO Crackers or vegetable dippers. Serve dip in a hollowed out round bread loaf, red cabbage or bell pepper. Simply cut lengthwise slice from top of 1-lb. round bread loaf. Remove center of loaf, leaving 1-inch-thick shell. Tear removed bread into bite-sized pieces to serve with dip or reserve for another use. Fill bread shell with dip just before serving. ADD salsa; mix until well blended. Cover. SPRINKLE with cilantro. Serve with assorted cut-up vegetables or tortilla chips. Cut TACO BELL HOME ORIGINALS Flour Tortillas into desired shapes. Place in single layer on baking sheet. Bake at 350°F for 8 to 10 minutes or until dry and crisp. Remove from baking sheet. Cool on wire rack. PREHEAT oven to 450°F. Toss chicken with 1/2 cup of the mustard. PLACE in single layer in foil-lined 15x10x1-inch baking pan. Sprinkle with salt and pepper. BAKE 25 to 30 minutes or until chicken is cooked through, brushing with the remaining 1/4 cup mustard during the last 5 minutes of the baking time. PREHEAT oven to 400°F. Cut bacon in half crosswise. WRAP each Little Smokie with half bacon slice; secure with toothpick. Place in 15x10x1-inch baking pan. BAKE 15 minutes or until bacon is browned. Substitute 1 pkg. (16 oz.) OSCAR MAYER Little Wieners for OSCAR MAYER Little Smokies. Prepare as directed except for baking. Wrap; freeze up to 3 months. When ready to use, thaw in refrigerator. Bake as directed. Cut bacon in half crosswise. WRAP each Little Smokie with half bacon slice; secure with toothpick. Place in 15x10x1-inch baking pan. MICROWAVE CHEEZ WHIZ and heat chili as directed on labels. 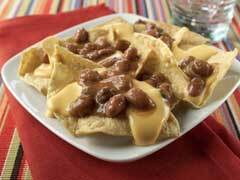 LAYER 1/2 of the tortilla chips, 1/2 of the hot chili and 1/2 of the CHEEZ WHIZ on serving platter. Repeat layers. By the time the first half is over, your guests will be ready to dive into some serious party food. These pizza, wrap and sub sandwich ideas are easy to make but hearty enough to satisfy your hungry team. What's more, they can be made ahead of time, so you don't have to miss any of the halftime show! Top each dough triangle with 1 Singles triangle and 1 frank; roll up. PLACE, seam sides down, on ungreased baking sheet. BAKE 12 minutes or until golden brown. Serve with your favorite condiments, if desired. Prepare as directed, using KRAFT 2% Milk Singles and/or OSCAR MAYER Light Beef Franks or Fat Free Wieners. Prepare as directed, spreading 1 tsp. 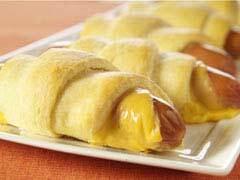 GREY POUPON Dijon Mustard, KRAFT Original Barbecue Sauce or ketchup on each crescent roll triangle before topping with Singles and frank. Place pizza crust on ungreased baking sheet; spread evenly with sauce. TOP with half of the cheese, the peppers and pepperoni. Sprinkle with remaining cheese. BAKE 10 to 12 minutes or until crust is lightly browned and cheese is melted. Serve with a crisp mixed green salad tossed with your favorite KRAFT Light Reduced Fat Dressing. Sprinkle with KRAFT 100% Grated Parmesan Cheese and dried oregano leaves. Sprinkle 2 Tbsp. KRAFT 100% Grated Parmesan Cheese over each layer of mozzarella cheese. COOK chicken, oil and chili powder in large nonstick skillet on medium-high heat 8 minutes or until chicken is cooked through, stirring occasionally. 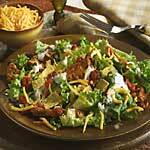 TOSS chicken mixture, greens, salsa, dressing and cheese in large bowl. STIR boiling water into gelatin in medium bowl at least 3 minutes until completely dissolved. Pour into molds to within 1/8 inch of top. REFRIGERATE at least 3 hours or until firm (gelatin does not stick to finger when touched). Dip bottoms of molds in warm water about 15 seconds. Pull gelatin away from all edges of molds with index finger. Slip finger underneath JIGGLERS® and gently lift from molds. Do not swallow JIGGLERS® whole. Your guests will want to get back into the game and back into snackin' after half time. Somewhere into the third quarter serve up the sweets! 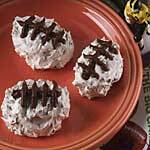 These dessert ideas from Kraft Foods will give everyone a boost to carry through to the end of the game! ADD crushed grahams to whipped topping; stir until well blended. SHAPE 2 tsp. of the graham mixture into 1-inch "football;" place on baking sheet. Repeat with remaining graham mixture. FREEZE 3 hours or until ready to serve. Pipe icing onto the footballs to resemble the lacings. Store leftover footballs in freezer. Mix dry pudding mix and baking mix in medium bowl. Stir in oil and egg with wooden spoon until mixture forms ball. SHAPE dough into 36 small balls, each about 1/2 inch in diameter. Place, 2 inches apart, on ungreased baking sheets. 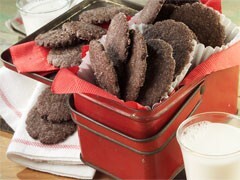 Flatten each cookie with bottom of drinking glass; sprinkle with sugar. BAKE 5 to 8 minutes or until cookies feel set to the touch. Cool on wire racks. The Bears will be counting on Grossman to avoid the turnovers that plagued him midway through the season. He may also be called on to make some plays if the Bears defense continues on its current slide. Urlacher's ability to cover so much ground is what makes the Bears' version of the cover-2 defense work so well. He also has the ability to take over games defensively, which he may have to do considering the way the unit has performed recently. Hester has game-changing abilities in the return game, but he has been known to lay the ball on the carpet from time to time. When he hangs onto the ball, however, he generally puts the Bears offense in great starting field position. The Bears have got to do a better job protecting the football during the playoffs. They can't afford another letdown game by Grossman, and he could get the hook if he doesn't protect the ball. The Bears defense has got to turn it back up a couple notches as well, or this team could suffer a disappointing end to a promising season. Fortunately for the Bears, they are dealing with a weak NFC field, and are probably the favorites at this point. It will be a different story, however, if they advance to the Super Bowl to face the AFC's best team. It's no secret Peyton Manning is the orchestrator of the Colts offense, and so much this postseason depends on how he plays. He has shown a tendency to get flustered in big games, and can be pushed out of his comfort zone when forced out of the pocket. However, he also has the precision to carve up any defense in the NFL when he is on. Dwight Freeney is the biggest impact player on this defense, but the play of MLB Gary Brackett against the run is going to be a much bigger key. The Colts have got to figure out a way to get off the field quicker on defense, and put the ball back into Manning's hands on offense more often. During their recent struggles, the Colts' possessions have been limited, and their time of possession has suffered because of it. The Colts have a serious problem on defense, and it's going to take the offseason to begin to correct them. Their inability to stop the run is not just a slump. Instead, its been a downhill spiraling trend since early in the season. If the Colts can somehow find some type of bandage to paste on this gaping head wound they call a run defense, they could be as dangerous as anyone in the postseason. In reality, though, it appears the Colts are heading for a quick exit from this year's playoffs. "Super Bowl", Super Bowl XXXVII logo, and Super Bowl Sunday are registered trademarks of the National Football League.